The dolling up scenario isn’t complete without adding finesse to our nails with deeply impressive nail make up. 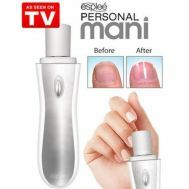 Order the discounted portable nails dryer lamp, electric nail trimmer and dozens of fascinating nail polish in light, dark and mild shades. Explore the latest collection of discounted nail polishes acquired from Gosh, Sweet Touch, Charji and The8pm at Savers Pakistan.